The National Institute for Occupational Safety and Health (NIOSH) requests assistance in preventing injuries and deaths among workers who operate, service, or work near skid-steer loaders. This type of loader is commonly used in agriculture, construction, and general industry for materials handling and excavating. NIOSH studies in the 1990s suggested that employers, supervisors, and workers may not fully appreciate the potential hazards associated with operating or working near skid-steer loaders and they may not follow safe work procedures for controlling these hazards. 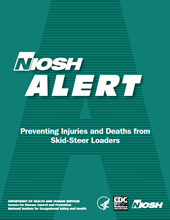 This Alert describes six deaths involving skid-steer loaders and recommends methods for preventing similar incidents.